I was thrilled to learn about the Philips DirectLife fitness program today. A few months ago I was diagnosed with high blood pressure ( only in my early 30's) and know I need to have a more active lifestyle and some kind of fitness program. I like the idea of the personal coach and support DirectLife offers. This is a great idea for busy moms that can not make it to the gym! I am excited that I will be reviewing the Philips DirectLife fitness program soon, keep an eye out and visit soon. Program uses smart technology and personal coaching to make busy, sedentary lives more active and enhance personal well-being. Philips is delivering on their commitment to be the leader in health and well-being with the launch of Philips DirectLife, a new customized, interactive fitness program that offers a fun and simple solution to people eager to adopt a more active lifestyle. The DirectLife program was born out of a desire to directly appeal to the more than 60 percent of the global population who fail to reach the minimum levels of moderate daily physical activity to deliver health benefits, as recommended by the World Health Organization1. DirectLife records a person’s daily movements via a discreet, wearable state-of-the-art Activity Monitor which tracks both the duration and intensity of a user’s daily activity. Information is then easily transferred in one simple step via USB to a personal web page that keeps track of progress against both daily targets and longer term goals. The program offers a number of unique features, including a personal coach to help people set balanced and achievable goals, provide individual feedback and deliver advice on how to make easy healthy lifestyle changes, some in as little as a few minutes a day. It is the use of all three mechanisms of support together – monitoring, measuring and motivating through a personal coach – which Philips DirectLife believes will lead to healthier everyday decisions and longer lasting, more active lifestyle change. Increased employee productivity. Physical activity programs in the workplace improve job satisfaction which leads to improved energy levels, employee morale, productivity and job attitude56. Regular physical activity also allows daily tasks to be accomplished with greater ease and comfort due to less fatigue7. 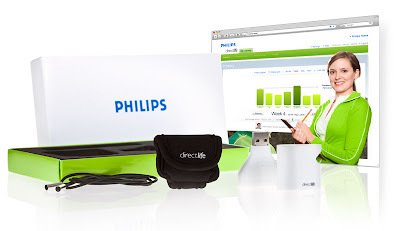 DirectLife is now available for consumers at www.philips.com/directlife for an initial fee of $99 plus shipping (includes Activity Monitor and first four months of membership). Standard membership fees are $12.50 per month, which include personalized communication with an expert coach. I can't wait to hear what you think about this product! It sounds great. I need something to kick me in the pants!